RR Lab Located in the heart of the city and caters its services for all the testing needs, of Textile related entrepreneurs with its wide range and expertise to add to its Quality standards. 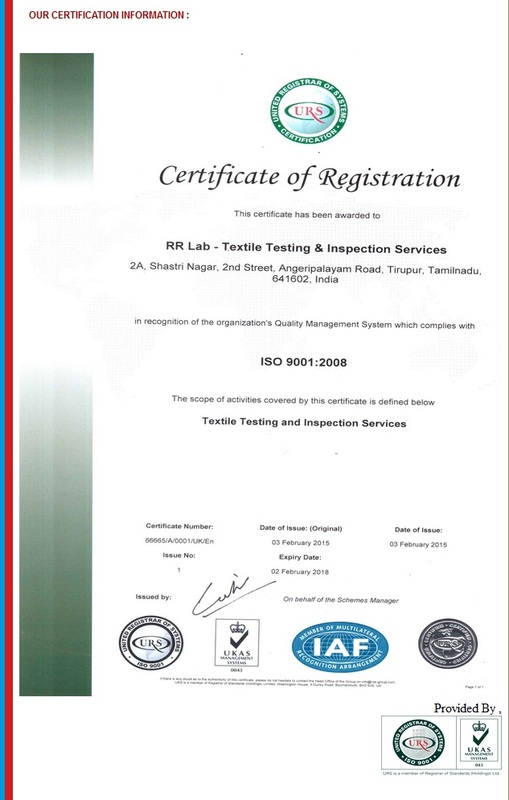 Test reports issued are impartial irrespective of any clients RR Lab provides testing facilities from yarn to Fabric & Garment, stretching it's services to garment inspections to various customer levels. It infuses the need for numerous client parameters. Our expertise and latest test equipments precisely meets with the preset standards of quality testing as per National & International standards. (like ISO, AATCC & BIS Standards ). Customer service is our vision. RR Lab lab aims at full fledged customer satisfaction. Reports are generally issued with in three working days. Emergency services are also available for certain tests. Test reports can be sent by fax, e-mail or courier. RR Lab also provides quality inspection services at various stages of garment production till the final audit. RR Lab serves the textile community with specialized services of setting in house lab to exporters and trains the people to face the various testing & compliance needs. With the on going demand of environmental provocative issues and need of eco-friendly materials, RR Lab congenially helps various institutes & export house in teaching the subject to the core. ° Fabrics & garments, Appearance after laundering.